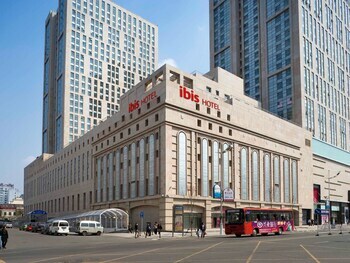 With a stay at Ibis Harbin Sophie Church Hotel, you'll be centrally located in Harbin, a 3-minute drive from Saint Sophia Church and 9 minutes from Heilongjiang Provincial Museum. Featured amenities include a business center, dry cleaning/laundry services, and a 24-hour front desk. Free self parking is available onsite. With a stay at Minghao International Hotel Yongchuan - Chingqing in Chongqing, you'll be within a 15-minute drive of Yongchuan Dafosi Temple and Waterscape Park. Free self parking is available onsite. With a stay at Home Inn in Chongqing (Yuzhong), you'll be within a 15-minute drive of Great Hall of the People and Chongqing Olympic Sports Center. With a stay at Manston Holiday Hotel in Wuhu, you'll be within a 10-minute drive of Jinghu Lake Park and Guangji Temple. A shuttle from the airport to the hotel is provided at no charge.